Hello, everybody who reads my blog! I've been away for awhile, so I couldn't blog for the past week and more, but I am back again. Weird Fact: Last week was the first time in my life I took a bus. Not a cool bus like the one on the picture, alas, but still. But I never drove in one before. 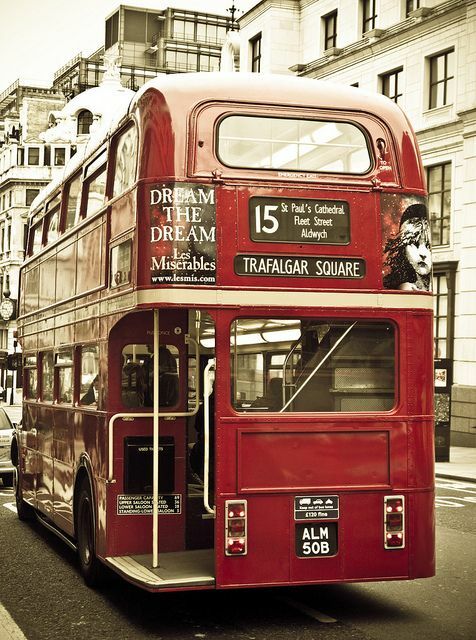 Just because we have a car at home and never had to use a bus. So it was kind of scary, doing it the very first time and all, but I enjoyed it very much. It was exciting and NEW. New things are always fun to do. An adventure, it is, for me, doing new stuff. 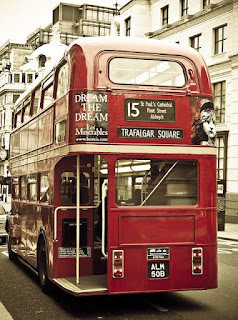 I can recall that I went on a bus once when I was very little, but that doesn't count. I only remember we had to stand, there where no seats left for us. So, now I know how to take a bus and all! Also, we had a lovely Indian Summer this week; when it's hot and the sun shines and its like Spain or Portugal in midsummer. We hardly ever have an Indian Summer in September. Indian Summer ... I love how that sounds. Now the weather has turned to normal. Cloudy and colder. I really look forward to fall, when I can finally start making that brown fall/winter skirt I want to make for such a long time. I allready stitched a few seams, but there was always something else to do. We also watched Inside Out again. I don't really like animated movies, but this is one of the few I don't mind watching. I especially love Joy and Sadness. The story is real interesting. I won't tell it all, in case you haven't watched this movie yet, but eventually Joy finds out how important Sadness actually is. 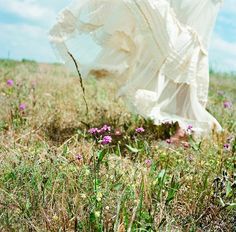 In the start she tried to keep her away from everything, believing Sadness would make their girl, Riley, unhappy. (they represent the emotions in the brain) There's a good story behind Inside Out. Joy looks fluffy though, if you take a closer look at her. I noticed that the second time we watched the movie. 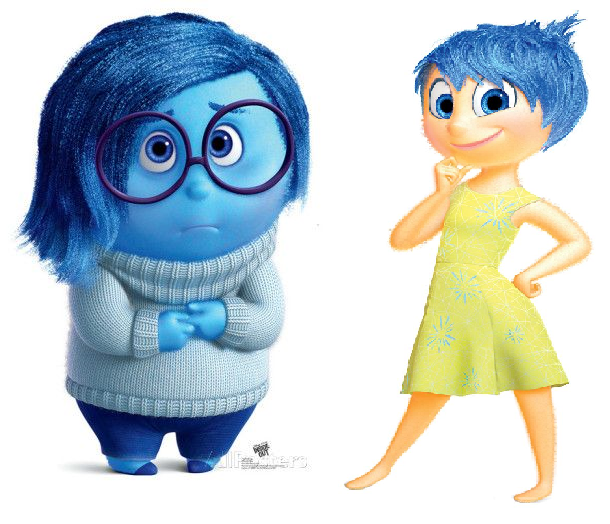 And I also noticed that Joy and Sadness both have blue hair. Maybe that wants to say that they are kind of the same. That they sometimes need to work together, instead of apart. 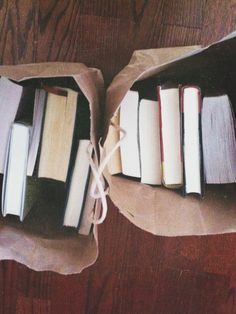 And then I read a lot, of course. I tried to read Vilette, written by Charlotte Brönte, but I couldn't. I just could not get on with it. And today I found this on Pinterest. Isn't that amazing? 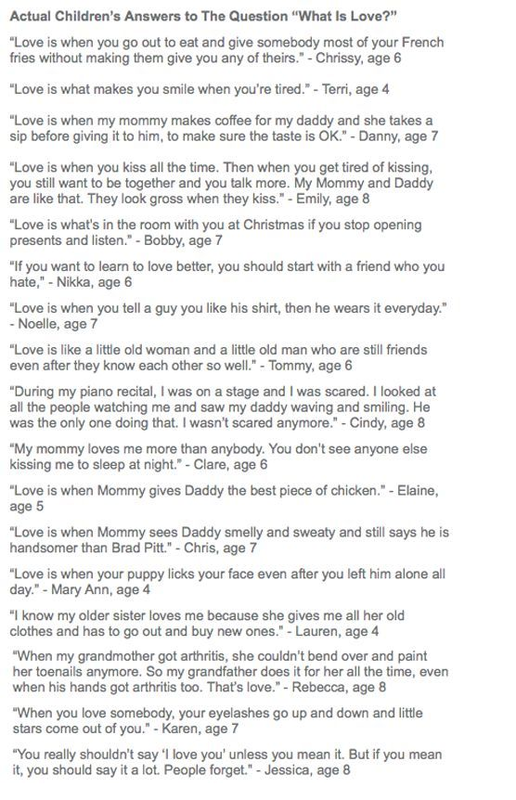 These little kids giving their definition of love, and they are so true. Some of them are funny, but most of them are beautiful. Things like this makes me blink, get a little teary, and want to write it all down and put it somewhere in my room where I can see it and think: little kids actually know it best. It's time to get away from my laptop and start doing stuff that needs to be done! So I'll say goodbye, for now.